As Art Brut front-man Eddie Argos has figured out, the secret to meeting your heroes is writing a song about them. At least, if said song appears on an album done by an internationally recognized post-punk outfit like Art Brut. 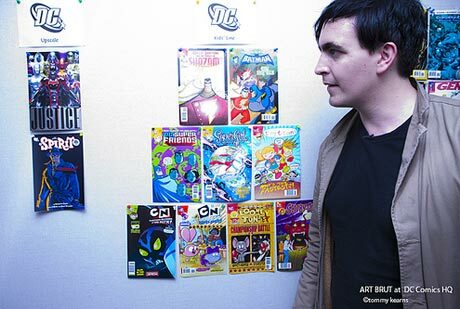 Thanks to the track "DC Comics and Chocolate Milkshakes" from the British outfit's latest slab of wax, Art Brut vs. Satan, Argos and the band were recently given an extensive tour of the coveted DC Comics headquarters in New York City. The trip was arranged by Under the Radar, the magazine where Argos has regularly professed his love for DC Comics in his column. "I have loved [DC Comics] since I was given a pile of Batman comics when I was ten," NME quotes Argos as saying. "I was surprised that the characters were expressing political opinions and shocked that people were getting murdered. I'd enjoyed comics previously to reading Batman, but I think deep down I'd always thought comics were only for children and that I was going to have to give them up one day. Discovering Batman made me realise that perhaps comics were something I could take with me into adult life." During the tour, Argos met with DC Comics' senior vice-president/executive editor Dan Didio, and was given a whole bunch of free swag, not to mention the shot to live out more than few childhood fantasies. To get a glimpse of the trip, you can check out this photo essay here.